If you live in a climate with freezing temperatures, your outdoor faucet has a risk of bursting on cold nights. This is a potentially serious problem, because when temperatures rise and water flows again, the faucet may leak, sometimes copiously. To prevent this, replace all spigots on the exterior of your house with frost-free faucets. 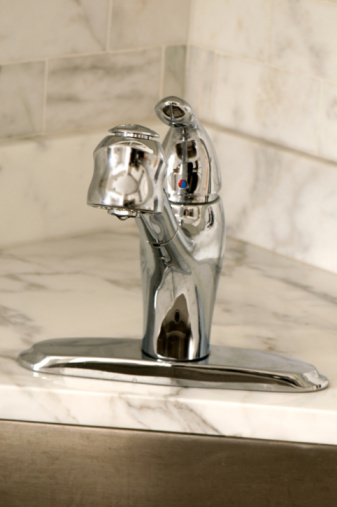 Frost-free faucets, sometimes called freeze-proof faucets, function in the same way as ordinary spigots. They have a compression valve that tightens down on the water inlet to stop water flow. The difference is that the valve chamber of a frost-free faucet is 24 inches long -- so when one is installed on the side of the house, the valve is indoors where it's warmer. When the faucet is off, there is no water near the faucet spout to freeze. When you retrofit your existing spigot for a frost-free faucet, you make the actual water connection inside your house or in the crawl space. Most models have a sweat connection you solder onto copper pipes or a threaded connection that you screw onto a threaded adapter. Frost-free faucets function like standard spigots, and they leak for the same reasons. To stop a leak, you usually have to replace a washer on the end of the valve stem.